The Aviator Hotel Sywell, Hotel England. Limited Time Offer! 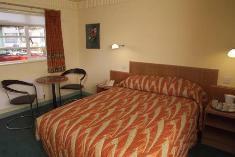 This Sywell hotelRead more is of a Family category and is a three star . You will find several amenities such as : Restaurant, Room Service, Bar, Newspapers, Non Smoking Rooms, Television.4 minutes by car distance from the center, this hotel is located at Sywell Aerodrome, in the north-west section of Sywell, which is ideal to discover the city.This hotel offers a unique service : garden.